Aloha Ebike enthusiasts! It all started very close to home with a simple dream from a father and son. With traffic, parking, and congestion issues growing on the island we asked ourselves- Why can't we ride bicycles more often for commuting, exercise, and exploring our surroundings? How can we replace our overpopulated, clunky polluting vehicles with something more practical? 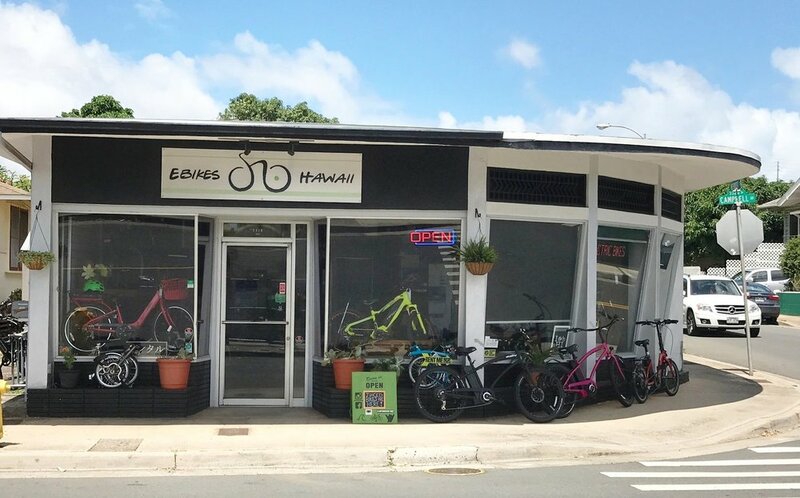 Here at Ebikes Hawaii, we believe that the electric bicycle is a crucial component in the next evolution of transportation. Ebikes promote a healthier way to travel for both the individual and environment. They are highly efficient, space saving, and cost almost nothing to operate. As of 2013, Ebikes Hawaii Corp. was born and what was once a dream has become a reality. Providing only the best products and services, we strive to increase awareness of the culture and benefits behind the electric bike movement. Give your car a break! With recent advancements in battery and electric motor technology, the electric bicycle has become a viable form of transportation. As a general rule of thumb, the Ebike can take you up to 20 miles at 20mph (although some of our bikes can take you up to 50 miles). Believe it or not, the average commute for automobiles in the United States around 10 miles! Never ridden an electric bike? It’s hard to describe into words. The feeling of riding an electric powered bicycle for the first time is something special. With all the technological advancements in lithium battery technology and electric motors- the power, efficiency, and ease of use will keep you smiling from ear to ear. It’s similar to the joy of riding a bicycle for the first time- just better! Climb hills with absolute ease, go long distances without wearing yourself out, and keep you (and your wallet) happy with a much more efficient means of getting around. No more expensive trips to the gas station! As a vehicle replacement, Ebikes are very affordable to own. They cost almost nothing to operate (half cent per gallon equivalent!) and require very little maintenance. It is best considered as a long term investment that will pay for itself through usage. Despite common misconception, Ebikes offer tremendous health benefits. They provide moderate, consistent exercise. Health studies have shown that this kind of workout is best for general health and well being. Best of all, the electric motor gives you the ability to work as hard as you like. You are in full control. "A Toyota Prius can get about 50 miles per gallon. Compare that to an electric bike, which runs on the equivalent of around 2,000 miles a gallon (on a dollar basis); meaning it's about 40 times more efficient."